and is denied by most attorneys! 1) VACCINES CAUSE ILLNESS AND INJURIES AND NEITHER THE PUBLIC NOR HEALTH PRACTITIONERS HAVE BEEN TOLD THE TRUTH BY CDC INC! In March 2011 an investigation by scientists exposed that the ‘UK government’ had been covering up the harmful effects of vaccines for the past 30 YEARS. Their study, “Health Hazards of Disease Prevention” was presented to the British Society for Ecological Medicine. It exposed that the UK ‘government’ ” . . . made continuous efforts to withhold critical data on severe adverse reactions and contraindications to vaccinations from both parents and health practitioners in order to reach overall vaccination rates which they deemed were necessary for “herd immunity”, a concept which with regards to vaccination, and contrary to prevalent beliefs, does not rest on solid scientific evidence . . .” The same is true in the UNITED STATES. In 1986 vaccine manufactures and administers were given immunity from liability with the passage of the National Childhood Vaccine Injury Act! And, the Vaccine Adverse Reporting System was established. Annually, it reports about 11,000 serious vaccine reactions, including up to 200 deaths and many more permanent disabilities. But, poor reporting in America suggests that annual adverse vaccine reactions, in fact, number from 100,000 – one million. 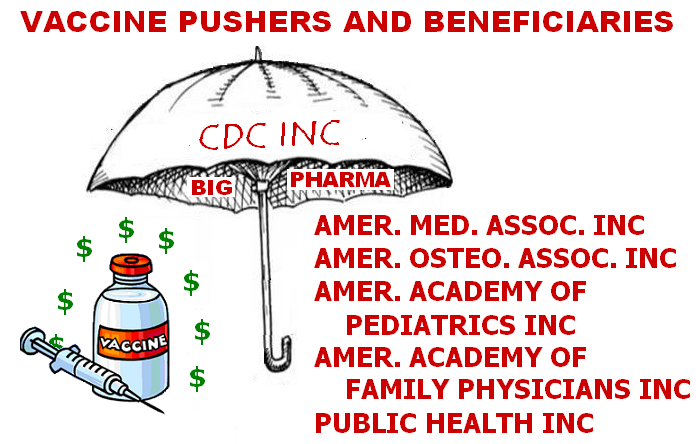 Then to ‘seal the deal’, the US Supreme Court decided in 2011 (Bruesewitz v. Wyeth) to grant big pharma immunity from liability even if their products were knowingly contaminated.
. . . AND SO ARE OUR SCHOOLS! We are living in a duality that most don’t recognize. Many suspect things aren’t going well as jobs are outsourced, public utilities and roads are privatized, and our elected officials keep passing bills they don’t read and that don’t solve any of the “real” problems we face. Most of us feel that our elected officials don’t really represent us anymore. Why is that? They represent corporations aka our state, local and federal governments; GOVERNMENT, INC. This scam has been going on a long time , but we feel the results of it more each year. Have you noticed how our elected officials are distant and difficult to reach once in office? Have you noticed how no matter how valid our complaints are – we are ignored? Have you noticed how few people ever get justice in our court system? This is because we are primarily living under admiralty, maritime or business “contract” law not Common Law or Constitutional Law. We, the people of the State of Ohio, grateful to Almighty God for our freedom, to secure its blessings and promote our common welfare, do establish this Constitution.